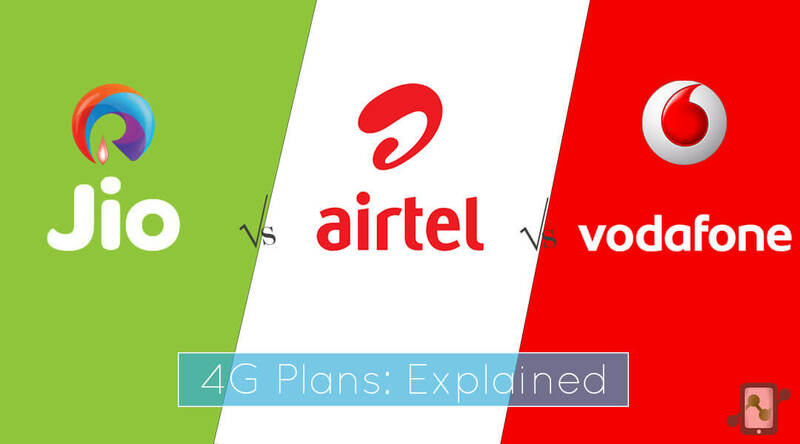 Reliance Jio vs Vodafone vs Airtel’s 4G plans explained. Reliance Jio is a telecom operator owned by Reliance Industries. Reliance Jio created a big revolution in the telecom industry when it launched its operations by offering free unlimited data to all the customers. This made the company a huge hit and people were even ready to stand in queues for hours to get a Jio sim. One thing to note is that Reliance Jio has started its telecom operations only on its 4G network so the customers would not get 2G or 3G services like standard voice calls. The customers would need a VoLTE (Voice over LTE) ready phones to make phone calls on Jio network. Reliance Jio last month made an announcement that it’s free services are ending wherein they offered Unlimited Data, Unlimited Voice Calls & SMS on 31st March. Instead, they have launched a Jio Prime plan. This plan offers Unlimited Data, Voice Calls and SMS for Rs.309/month. The plan includes 1GB 4G data/day and Unlimited everything else. Relaince Jio has also promised that the data used in the voice calls would not count against the 1GB data limit. Now, both the major telecom operators,Vodafone and Airtel have launched their 4G plans which compete directly with Reliance Jio at a similar price. New upcoming features of Android O leaked; Release date & Name.